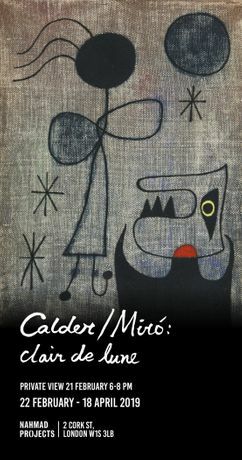 Featuring sculptures by Alexander Calder and paintings by Joan Miró, exploring the artistic impact of their friendship. Nahmad Projects is pleased to announce “Calder / Miró: Clair de lune,” running from the 22 February to 18 April 2019. The exhibition features sculptures by Alexander Calder and paintings by Joan Miró, exploring the artistic impact of their friendship. The artists’ lifelong affinity lasted from their initial meeting in 1928 through to old age, with continuous correspondence disrupted only by war. Calder’s monumental mobile, Blue and Yellow Among Reds (1964) will dance next to Joan Miro’s great canvas of the same period: Oiseau dans la nuit (1967). The pairing draws attention to the formal and theoretical parallels of these large-scale works. Innovating in three dimensions, Calder explored “the idea of an object floating ... to best approximate this freedom from the earth.” Miró suspended his figures and animals in a twilight zone between the real and subconscious, freeing them from pictorial ground. The artists’ exchange of ideas coloured each of their contributions to the cultural and political questions of their time. Experiments with forms of play unlocked new modes of representation, resulting in the creation of new visual languages. Calder added movement and air space to the vocabulary of abstract art. Miró “destroyed painting” with his use of non- hierarchical materials, and defined a new style that hovers between representation and total abstraction. Their shared revelry in making underpinned a serious drive towards iconoclasm. 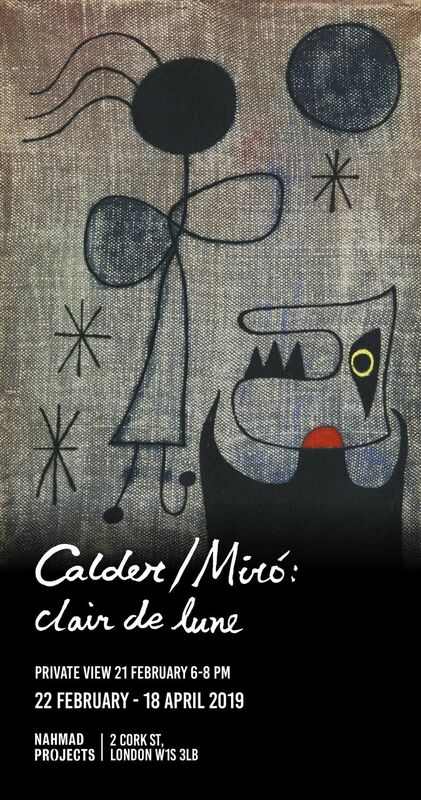 Joyful and irreverent, the works of Calder and Miró are testament to their lifelong defence of creative freedom.